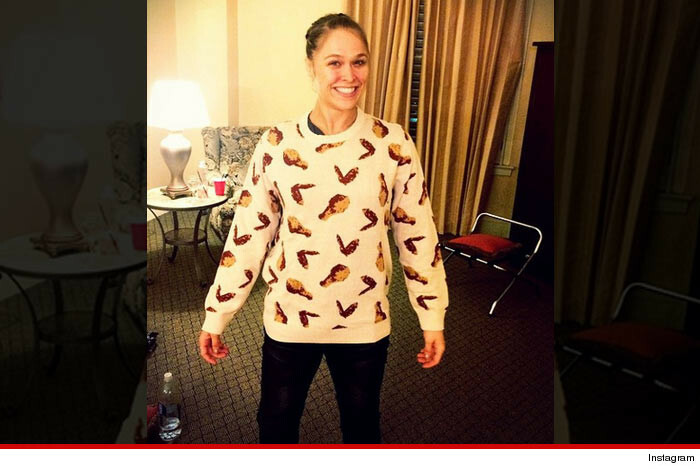 Ronda Rousey crushed Cat Zingano in 14 seconds (new record) like she crushes hot wings after her fights. Ronda in her designated hot wing eating sweater. Not totally unexpected considering the fights question to be answered was: what happens when the daughter of a world champion judoka who got woken up in the middle of the night by her mothers armbars as a child grows up, trains all her life, wins bronze at the Olympics and then trains MMA with the worlds best trainers (***big breath***) fights someone who essentially started out training mma in 2008 as a hobby and as a way to keep in shape? Well here’s the entire paragraph-question distilled in a 14 second GIF. I like watching Ronda fight but I need to stop buying these pay per views. At $50 per 14 seconds I’ve essentially paid the equivalent of $12,857 per hour. What did you think of the fight? Should Ronda start fighting men?? MAKING JUDO RELEVANT IN THE UFC? Thought you might enjoy this breakdown on ronda I did on the fight network with Robin black before the fight. I really liked that break down. High quality video, solid knowledge, nice demonstrations between yourself and Robin! Let us know if you ever want to write anything for ArtOfGrappling, we’d be happy to publish it! I know this is fight is old and Ronda got destroyed by Holms, but the “fighting men” comment caught my attention. No man should ever fight a woman because it’s a no-win situation. He wins “he beat a girl” He loses “He lost to a girl”. The match only benefits the woman. True, it is a no-win situation for the man, but it’s not always about the man. Sometimes I miss the Pride Fighting days that demonstrated smaller guys can beat bigger buys who are not as skilled martial artists, and, although they never had a man vs women match, I think most people would be surprised at how many guys Ronda, Holly and Meisha would be able to beat down.